Bill and Fred jam together during the 11/25/95 Little Feat at Lowensaal in Nuremberg, Germany. HOY HOY FEAT FANS & HAPPY HALLOWEEN !!!!! We’ve got all treats and no tricks (well, maybe a few tricks up our sleeves also! ), coming at you on this the eve of all hallows….the latest free download track from the forthcoming CD titled “Rams Head Revisited”. It’s a tasty little track called “Hi Roller”, on which our good friend, Ron Holloway, has sparked some of his magic. We have it on good authority that this track is road tested great driving music, even if you’re not on your way to Vegas or Atlantic City!....and don't forget, "Rams Head Revisited", in it's entirety, is coming soon!!! Gary Bennett, from the Feats At Five radio show, interviewed Fred Tackett at the Little Feat show in St. Louis on 09/24/2010. They discuss Fred's new project, Silver Strings, and his invlovement with Little Feat since the early days. Here's another Free Download from the upcoming Little Feat Release "Rams Head Revisted"? Presented for your listening pleasure, the classic "Walkin' All Night" first heard on the lp "Dixie Chicken". You won't feel like "walkin'" as you hear this great new cut--you'll feel more like "dancin' all night"! Join us on Radio Margaritaville tonight at 5PM Eastern for a very special one hour Feats at Five in honor of Richie Hayward. Here's another recording of Richie playing with the "Justice League" on January 21st 2000....Day At The Dog Races. Here's a recording of Richie playing with the "Justice League" on January 21st 2000. 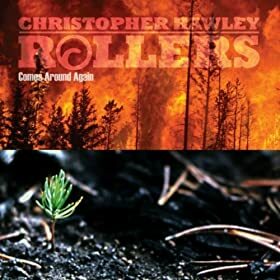 The third album of California rock n’ roll from the Christopher Hawley Rollers is now available on iTunes. Play a sample of this wonderful CD HERE. Christopher Hawley wrote the music and lyrics, as well as plays electric, acoustic and slide guitar on the album. These eleven original songs feature Bill Payne from Little Feat on keys and John Steward from Fishbone on drums and is the first all-studio album by the Christopher Hawley Rollers. The band has managed to put out two records in the last two years while playing over 200 shows annually. Christopher Hawley’s haunts are ski towns, artist communities, beach bars, and college towns. With his much-anticipated third album Comes Around Again (available on iTunes), the open-hearted troubadour offers uplifting vibes and conscious music to an even wider audience. Constant touring in the Western US over the past ten years has established a grass-roots fan base, planting seeds for success. This Venice, CA-based avid skier, surfer and yogi has mastered the art of raising spirits through music with a combination of inspiring lyrics, positive attitude, and danceable grooves. Rooted in the Colorado jamband scene of the '90s and evolved from the legacy of great singer-songwriters like John Fogerty, Bob Marley, Johnny Cash, and Bob Weir, Christopher has created a unique blend of music. His seasoned guitar style and sense of melody reflect diverse multicultural influences. Lead guitar and slide breaks à la Duane Allman, Ali Farka Touré, Eric Clapton, and Jerry Garcia enliven the well-crafted arrangements. A particularly large influence was Lowell George of Little Feat. Not only does Christopher emulate Lowell’s extremely expressive guitar playing, but also his vocal style and multi-layered song-writing to creative a repertoire of music blending multiple genres. In the vain of Little Feat tunes, Christopher’s songs blur the boundaries between island music, gospel, southern blues, New Orleans music, funk and country rock. Over the years, Christopher’s songs have attracted some of the most proficient players to be a part of the collective known as the Rollers. The musicians’ shared sense of adventure genuinely comes across in the music. The latest Roller to record with the band is Bill Payne from Little Feat. The eleven-song disc of newly recorded studio tracks are bursting with juicy guitar from Christopher Hawley. Bill Payne’s distinctive performances permeate the album, with his soulful piano and organ sounds. John Steward, a regular Roller when not drumming with the band Fishbone, fully embraces the multiple song styles. The album kicks off with War No More, a rhythmic anti-war groove with afrobeat influences and a biting melodic guitar solo. Lizziebot’s Arm Bands bearing positive messages inspired this song. Lay It On Me, a laid-back acoustic funk tune about communication, culminates in a tight conversational interplay between John’s drums and Christopher’s electric guitar. Bill Payne’s rolling barroom piano sets the stage for Bank Robbing Man, which portrays a nonviolent tale from the Old West about robbing banks and trains from an outlaw’s perspective. In the swampy danceable gospel groove When Jesus Fed the Multitude, the theme of gratitude is enhanced by Bill Payne’s uplifting mastery of the Hammond B3 organ. The evocative acoustic piece Home is punctuated by shimmering pedal steel and big drum fills, and Bill Payne’s ethereal piano. Christopher sings from the perspective of a eco-conscious surfer with the awareness that we are all interdependent on the ocean no matter where on earth we live. The guitar part in the chorus of The More of You I Know was inspired by kompa style taught to young Christopher by Haitian musicians. The lyrics, which came to him in a dream at his grandparents’ house in Haiti, speak of traveling to distant places and embracing the unknown. Once again, Bill Payne’s piano solo transports the song to another dimension. The highlight for Little Feat fans will be track 10, Johnny Appleseed -- an instant classic tune. Johnny Appleseed is an American parable told in the vein of Lowell George epic story songs. The rhythm is reminiscent of New Orleans grooves purveyed by Little Feat music and punctuated by Bill Payne’s polyrhythmic piano playing. Comes Around Again offers good-time music to enjoy life by – filled to the brim with musings of appreciation and traveling tales from a man who sings them with all his heart. Time for another free download to get you lovely Feat Fans through the long, hot weekend…….and next up is TRUCK STOP GIRL . You know the story – he’s young, he’s road weary, he’s far from home, he walks into her joint and, well, this won’t end well ! Listen to it it here and crank it up! Little Feat landed in NYC this past January and had an opportunity to invite Larry Campbell up on stage...for what was a MAGICAL night of music. Here's a sample of Bill Payne and Larry Campbell jamming together during Bill's keyboard solo in Dixie Chicken. You can’t get something for nothing. That’s what they say. But summer is here and the time is right for some Little Feat in the street. Starting this week Little Feat is introducing its next release, Rams Head Revisited, with a series of free downloads. The downloads will appear periodically here and on the Little Feat website (www.littlefeat.com ) in anticipation of the release of the complete album. Feat Fans (and whoever you’d like to share this information with !) can have the proverbial “free lunch” - and it’s on the band. First up; the classic ‘Cajun Rage’, recorded live during the epic, sold out, Ram’s Head three-night stand of May 2nd, 3rd and 4th, 2010. We dedicate this song to the good people of the Gulf Coast and if you don’t know why, and you aren’t outraged yourself, you haven’t been paying attention. So there you have it, the elusive “something for nothing”, available at www.littlefeat.com ! Please also stop by and visit us on FaceBook, where you can share your thoughts on the music, or just about anything else, with the rest of the Class – which, by the way, is currently at 36,000 folks - so it may be tough to find a seat. The Feats At Five Radio Show is now in a new 15 minute format. Due to unknown circumstances beyond our control, Sirius/XM radio has decided to cut the spectacular Feats At Five radio show down to 15 minutes, from its normal one hour time slot. We hope this is a temporary change and encourage all fans to contact Sirius/XM to express your thoughts concerning this matter. From The Board; is cancelled due to the new show format. The Feats At Five Radio Show is now in a new 15 minute format. Due to unknown circumstances beyond our control, Sirius/XM radio has decided to cut the spectacular Feats At Five radio show down to 15 minutes, from its normal one hour time slot. We hope this is a temporary change and encourage all fans to contact Sirius/XM to express your thoughts concerning this matter. Note: “From The Board” is cancelled due to the new show format. First show with new 15 minute format. Feats At Five will no longer be an hour long show. Sirius/XM radio has decided to cut FAF to 15 minutes. CD’s and downloads of the three 2010 Jamaica shows are now available at www.LiveFeat.com. Visit Little Feat's new Official Facebook page. This is the second encore song played at the last show in Jamaica. Little Feat was joind by the Overtakers for a version of Movin' On Up. CD's or downloads of a 3 2010 Jamaica shows are availble for sale at www.LiveFeat.com. This is the second encore song played at the last show in Jamaica. Little Feat was joind by the Overtakers for a version of Proud Mary. This is the fisrt encore song of the last of 3 shows in a row on 03/07/10. "(You Gotta Walk) Don't Look Back" originally recorded by the Temtations in 1965 and later made popular by the Peter Tosh and Mick Jagger version. and Warren Hood jamming together during Bill's keyboard solo in Dixie Chicken. Check out more of Warren's work at his WEBSITE. While you're surfing, check out Bill's MySpace page too. Harvest Jazz & Blues Fest.